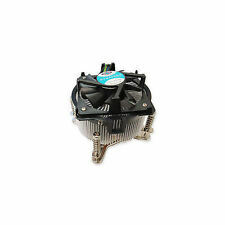 Fan Speed 2200RPM ± 10%. Low noise hydraulic bearing ，the outer and inner quiet move to achieve the perfect combination of performance and silent. Type CPU Cooler. 1 x CPU Cooler. Fan fin assembly designed superb cooling performance. AMD socket 754/939/AM2/AM2 /AM3. 1 x CPU Cooler. 1.3pin power CPU Quiet Cooler. Fan rotating speed:2000±10%RPM. Fan noise:22.6dB ± 10%. Fan Airflow: 43.67CFM. Due to the different monitor and light effect, the actual color of the item might be slightly different from the color showed on the pictures. Features: 1.CPU Fan (Cooler): 775 2.Headsink Dimension: φ90×25mm 3.Fan Speed: 2500±10%RPM 4.Noise Level: 19dBA(Min) 5.Voltage:12 VDC 6.Application: Intel Intel Celeron LGA775 All Model Brand Unbranded/Generic UPC Does not apply MPN Does Not Apply. Keep your CPU cool! It supports Core 2 Duo Socket 775 CPUs up to 3.0 GHz! Heatsink Not Included. ITEM HAS NOT BEEN TESTED. 1PC x CPU Radiator fan. Fan Speed: 2000±10%RPM. Fan Life Expectancy:40,000 hours. Fan Noise:19dBA. Fan LEDs:5Colors 25Pcs. Due to the light and screen difference, the item's color may be slightly different from the pictures. Supports Socket 775 CPUs. 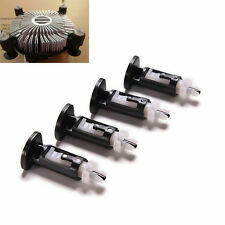 1 x Aluminum 4Pin Heat Sink & CPU Cooling Cooler Fan. Excellent cooling performance to keep your Socket processor safe and cool. 4-pin power connector. We will do our best to solve problem. Pentium Dual-Core. Core 2 Duo. 1 X Fan Cooler. We can resolve for you ! We accept. AMD AM3 / AM3 / AM2 / FM2 / FM2 / FM1 socket. 1 x CPU Heatsink. Type CPU Cooler. 6U shape sintered powder heatpipes conduct heat from the processor quickly to protect it from overheating &Twin-tower heatsinks give superb cooling performance. Mount pins only, no other devices are included. Low noise hydraulic bearing ，the outer and inner quiet move to achieve the perfect combination of performance and silent. Type CPU Cooler. 1 x CPU Cooler. Fan fin assembly designed superb cooling performance. AMD: Socket FM2 / FM2/ FM1/ AM3 / AM3/ AM2 / AM2 CPU. Socket Type Incredible performance for price. California Law. These fees are non-negotiable. This includes California residents. Back To Top. Portable DVD players with LCD screens. AMD AM3 / AM3 / AM2 / FM2 / FM2 / FM1 socket. 90mm fan, the outer and inner quiet move to achieve the perfect combination of performance and silent. Type CPU Cooler. 6U shape sintered powder heatpipes conduct heat from the processor quickly to protect it from overheating &Twin-tower heatsinks give superb cooling performance. Scythe Kozuti Low Profile CPU Cooler for LGA 1366/1156/1155/775 and Socket AM3/AM2 /AM2 (SCKZT-1000). ‣ Monitor Mounts. OutletPC was founded in 2001 and since then we've been focused on getting people around the world great deals on computer products, systems, and hardware. For All Socket 775 CPU. Dynatron Model P785. At Duty Cycle 20%: 1000 rpm. Speed At Duty Cycle 0%: 1000 rpm. At Duty Cycle 20%: 0.54 W. At Duty Cycle 20%: 8.36 cfm. At Duty Cycle 20%: 20.6 dBA. At Duty Cycle 100%: 5500 rpm. At Duty Cycle 100%: 9 W.
Five colour LED fan fin assembly designed, superb cooling performance. --Aluminum Fin permutations and combinations of science, with enhanced air duct system, cooling performance is more superior. Weight : 400 g. Noise Level : <39 dBA. Fan Speed : 4500±10% rpm. 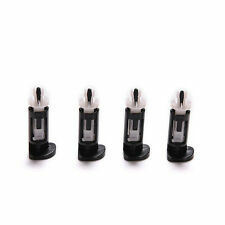 Mfr Part Number: FREEZER 13/UCACO-FZ130-BL. These fees are non-negotiable. This includes California residents. California Law. Back To Top. The manufacturer seals on the item must still be intact. Portable DVD players with LCD screens. Trending at $39.72eBay determines this price through a machine learned model of the product's sale prices within the last 90 days. Dynatron P985 Desktop & Workstation PWM CPU Cooler Socket 775. Model: P985. Heatsink Material: Aluminum Radial Fin Heatsink with Copper Inserted. Type: Fan & Heatsinks. Fan Size: 92mm. Trending at $10.56eBay determines this price through a machine learned model of the product's sale prices within the last 90 days. Includes the heatsink, fan, bottom mounting bracket and thermal paste only. Solution 2U & Up. CPU Socket 775. Material Copper Heatsink. Lead Wire Pin Out Air Pressure At Duty Cycle 100%: 44.88 dBA. At Duty Cycle 50%: 34.39 dBA. At Duty Cycle 25%: 20.23 dBA. A dependable, high quality CPU cooling solution, the Socket 775/Socket T CPU cooler is backed by StarTech's 2-year warranty. Manufacturer: StarTech. The CPU cooler features a large aluminum heatsink that maximizes dissipation of the heat around the CPU, as well a low-noise 95mm fan that provides up to 50 CFM of air circulation, helping to keep the CPU cooler for optimized performance. Your first choice for the best products, lightning fast. parts, accessories, etc. for this Manufacturer Part Number. has been received. utilize warehouses across the Continental United States. Core 2 Quad Processor Socket T Q6600~6700. LED CPU FAN. Clearance: 68mm, from where the heatsink touches the CPU to the top of the fan. Pentium 4 socket T 505 ~ 570J 620 ~672. Greatest cooling performance with 9.5cm crystalblue LED fan. Fanless: Yes. Socket: 775. Cooler type: Passive. Type: CPU Cooler. Material: Copper. One of our specialized electronics recycling programs includes refurbishing electronics and putting them back to use. 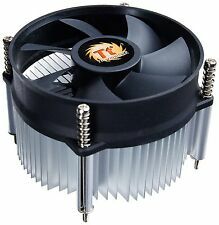 Scythe Kotetsu CPU Cooler for LGA 2011/1366/1156/1155/1150/775 & Socket FM2 /FM2/FM1/AM3 /AM3/AM2 /AM2. CPU Socket AMD Socket: FM2 /FM2/ FM1/ AM3 / AM3/ AM2 / AM2. Material of Base Plate: Nickel-plated copper. This cooler is set up for mounting to socket LGA-775 but could probably be adapted to a more modern platform as well. Intel E30307-001 Socket 775 Copper CPU Heatsink Fan Cooler 4-Pin PWM Connector. Condition is Used. Shipped with USPS First Class Package. AMD: Socket FM2 / FM2/ FM1/ AM3 / AM3/ AM2 / AM2 CPU. Socket Type California Law. These fees are non-negotiable. This includes California residents. Back To Top. Portable DVD players with LCD screens. 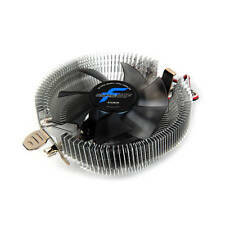 Silenx 92mm Mini HTPC Silent CPU Cooler EFZ-92HA2.